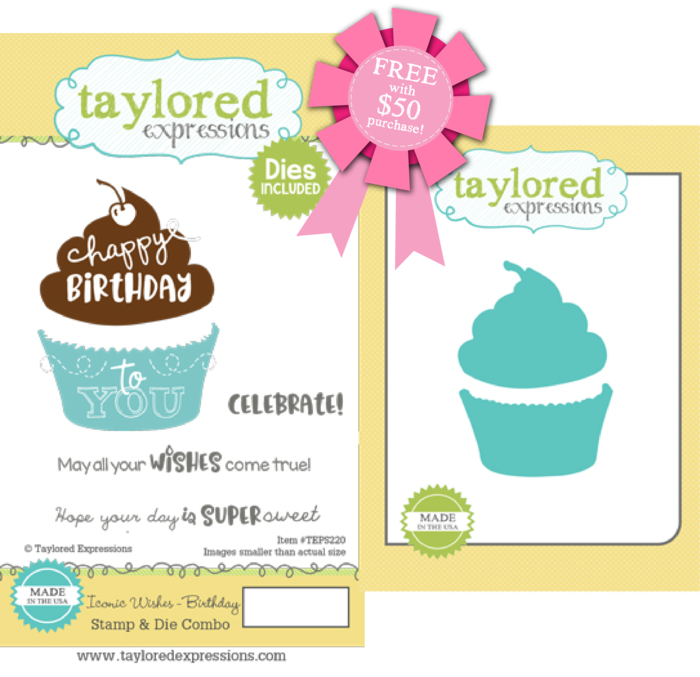 Taylored Expressions September Release Day: P is for Party! 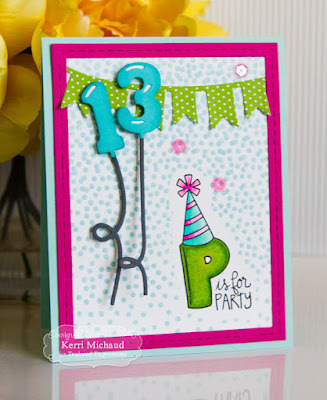 I have a couple more cards to share with you today using the new products, and the first uses the new B is for Birthday Stamp Set along with the Free Fall Background Stamp and the new Number Balloons Dies and Balloon Strings Dies! I started by stamping my P is for Party sentiment onto Sugar Cube cs using Oreo Ink. I colored the image with Copic Markers, then stamped it again onto another piece of paper and cut it out to use as a mask. 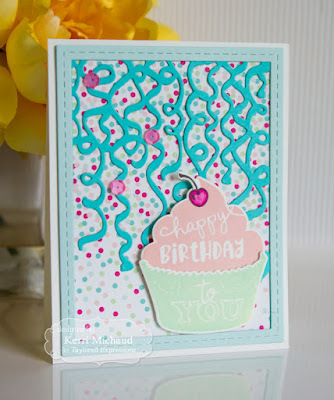 After masking my image, I used the Free Fall Background Stamp and some Sprinkles Ink to stamp the bg. 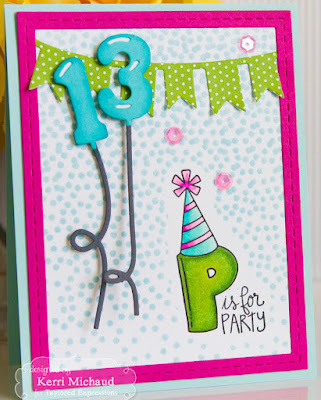 I framed the image with a frame cut out of Lollipop cs using a Stitched Frame Stacklets 1 Die and cut the banner using the Party Banner Border Die and some dp from the 6x6 Rainbow Brights Paper Pack. I added the balloons using the new Number Balloons Dies and some Cookie Monster cs. The strings were cut out of Poppy Seed cs using the new Balloons Strings Dies. 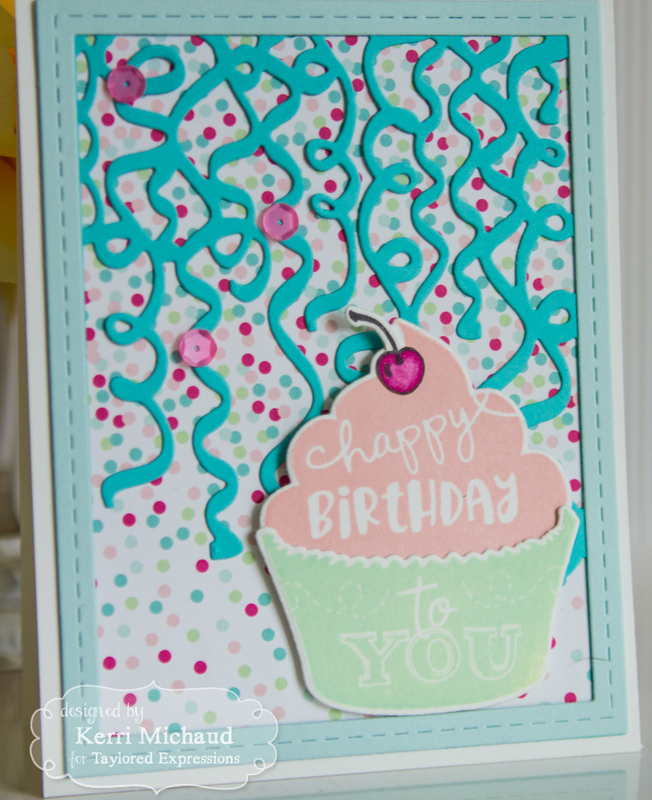 Finally, I added some Sequins and the Sprinkles cs card base and it was complete! For my next project, I used the fab new Curly Q Cutting Plate-LOVE!!! 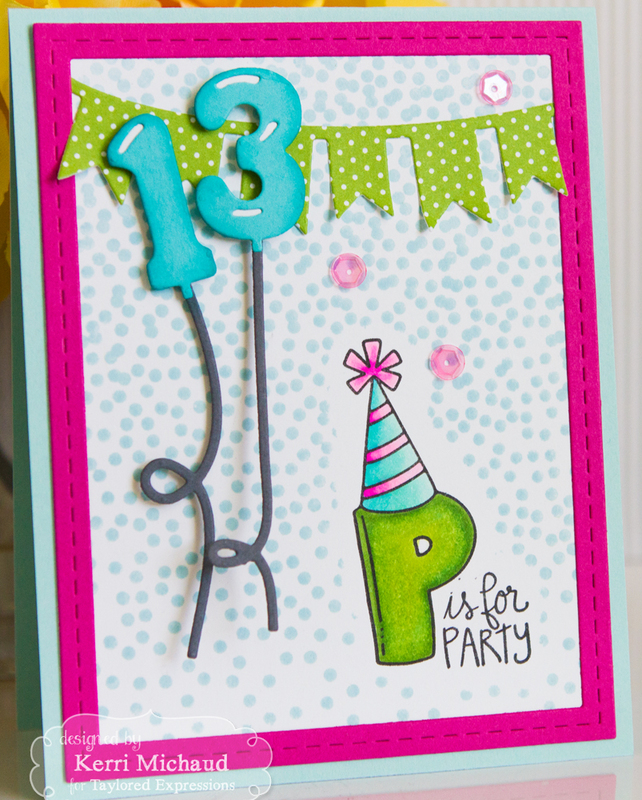 as well as the Iconic Wishes-Birthday Stamp & Die Combo which is a FREE gift with $50 purchase! 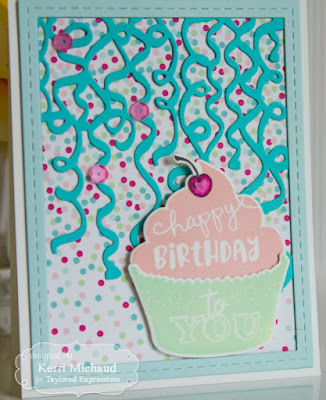 I started by stamping the top of my cupcake with Pink Champagne Ink and the bottom with Mint Julep Ink. I cut them out with the included dies. I then stamped the cherry portion of the cupcake with Oreo Ink, colored it with a Copic Marker, and cut it out so I could add my cherry to the top. For the background I used some dp from the Hello Happiness 6x6 Paper Pack. I then cut the streamers using the Curly Q Cutting Plate and some Cookie Monster cs. I popped my cupcake up with Foam Tape over the streamers and then framed the image with a frame cut out of Salt Water Taffy cs using a Stitched Frame Stacklets 1 Die once again:) I added the Sequins to finish it off. Don't forget about the party favor! For a limited time, when you spend $50 or more at the TE Web Store, you’ll earn this super sweet Iconic Wishes - Birthday Stamp & Die combo FREE!